Jewelry is a major part of Primavera Gallery. They offer fine, rare and collectible jewels spanning over 200 years of jewelry design, with pieces dating from the late 17th century up until the present. Their emphasis, however, is on unusual signed pieces, Art Deco through the 1960’s. They are not interested in large diamonds or masses of precious stones — this, for them, is geology rather than jewelry. They are interested in great style, exciting design and integrity of workmanship. Their collection includes all of the major individual designers, as well as the great jewelry houses. In their spacious new Chelsea gallery, they are also showing jewelry by both well-known and emerging Studio jewelers. They also offer the work of individual contemporary jewelry designers of special merit, among them Pol Bury, Bruno Martinazzi and Andrew Grima, and they are adding interesting contemporary and studio jewelry from many talented designers working today. A very unique cocktail ring. 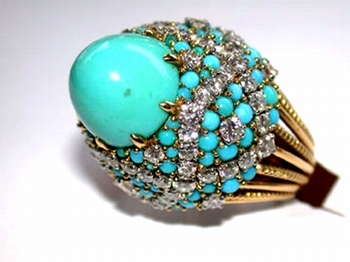 The sugar-loaf turquoise set in a domed turquoise and diamond base creates, literally, high drama. 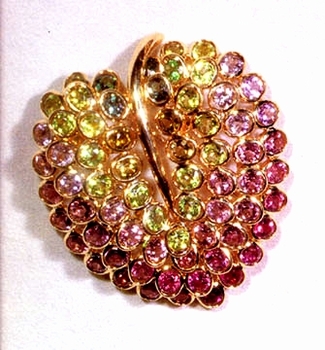 The House of Marchak excelled at creating unusual pieces, and especially this kind of jewelry in the 1950’s. 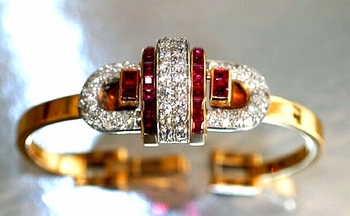 An elegant and refined bracelet with great Art Deco style in 18k gold set with damonds and calibre-cut rubies. The clasp is also set with rubies, and the central motif cleverly conceals a watch. The House of Boivin is well known for beautiful jewelry based on natural forms. This leaf shimmers with the colors of aquamarines, peridots, citrines, and amethysts. It will bring Springtime to any season. A wonderful vintage Buccellati, with their famous exquisite gold and silver work, and a 4 carat diamond of unusual and mysterious color. Pale blue chalcedony was one of Suzanne Belperron’s favorite materials. 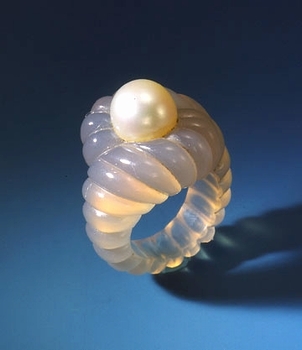 Here, it is finely carved and centers a fine pearl. 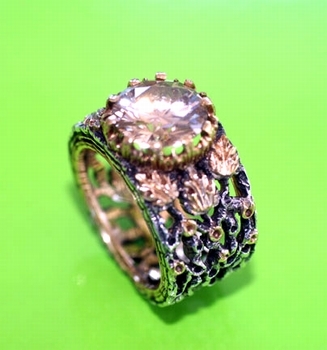 Belperron’s jewelry is in great demand, and there are few pieces around. This is a beauty. Lot’s of pretty stuff to admire on their website.